A case of mistaken identity (part 2). 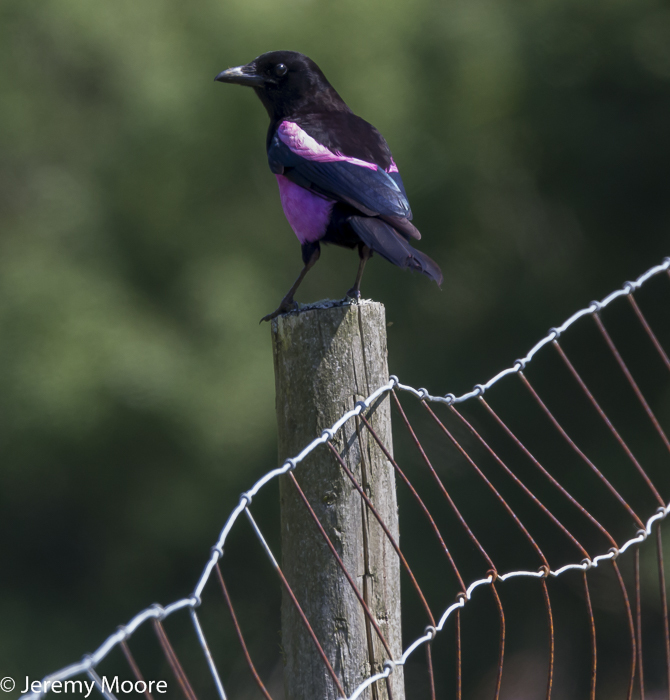 A couple of weeks ago there was a report on the Pembrokeshire bird blog of a rose-breasted starling near St Davids, and as I was in the area delivering postcards I thought I would have a look for it. I’ve never seen a rosy starling, but as I am probably the world’s worst twitcher I didn’t hold out much hope. What I did find won’t add to my bird list – not that I have one – but it was even more interesting. The bird had been reported from a rural garden about a mile from the centre of St. Davids. Rather than just turning up on the doorstep I walked, and as I approached the property along its drive (also a public right of way), I briefly saw something flying into bright sunlight which left me gobsmacked. It appeared to be a magpie but it was glowing red all over. I wondered if I was hallucinating! Finding a slightly elevated viewpoint, I sat and waited for it to re-appear. And it did! In better viewing conditions this time, a magpie appeared whose white feathers were all bright pink. It was an astonishingly beautiful creature. Its tail feathers were short suggesting a juvenile bird. A few minutes later another birder arrived, and the lady of the house ran out to meet him. I joined them. By this time the woman’s husband arrived, protesting that it was definitely a rosy-breasted starling. I pointed out that it was about four times the size of a starling. We agreed that the only solution was to try to photograph it; did I have my camera with me? You’ve guessed it. No. Once that conversation was over the woman and I realised we knew each other; she was Gail Lloyd who publishes a range of greetings cards. We had met on several occasion, and also had a treasured mutual friend in Penny Condry, the widow of Bill, the naturalist, writer, and one-time warden of the Ynyshir RSPB reserve. She confided in me that she had thought it was a magpie all along! Keen to get a proper identification she agreed to let me bring my van down the drive to the house and use it as a hide. The resulting photograph is not quite what I had hoped for , and doesn’t really do the bird justice. But it does confirm its identity. You can see that the iridescence on the bird’s secondary feathers is blue (as it is on a normal magpie) but I believe that an overall red iridescence can also be seen, which would account for my first sighting. Magpies like this have occasionally been reported elsewhere, and have been attributed to deliberate or unintentional human interference, but I cannot believe this would be the case in oh-so-respectable St Davids. Otherwise it appears that erythrism – defined as “a congenital condition of abnormal redness in an animal’s fur, plumage, or skin” – may be the explanation. So there we have it. A pink and black magpie. 2 Responses to A case of mistaken identity (part 2). It’s a beautiful picture Jerry, I had heard of ‘pink’ magpies before but you taught me something about tail feathers – I’ve seen a magpie a couple of time recently with short tail feathers and thought it had lost them somehow, but I guess it was a juvenile. Thanks Andrea. I’d like to have taken a better photograph but this one does the job.